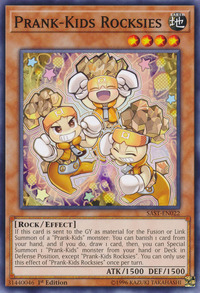 If this card is sent to the GY as material for the Fusion or Link Summon of a “Prank-Kids” monster: You can banish 1 card from your hand, and if you do, draw 1 card, then, you can Special Summon 1 “Prank-Kids” monster from your hand or Deck in Defense Position, except “Prank-Kids Rocksies”. 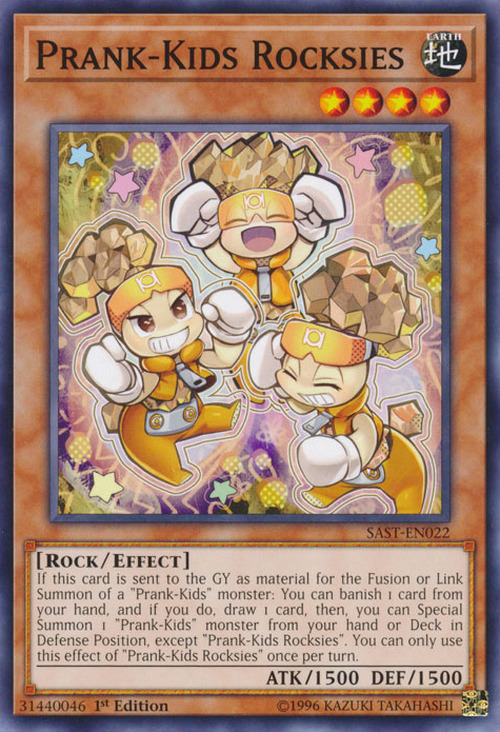 You can only use this effect of “Prank-Kids Rocksies” once per turn. This card is the only member of the Prank-Kids archetype to not be a FIRE Pyro, WATER Aqua, or WIND Thunder monster.